The stripy shed is no more. Well…. the stripy shed is still there but as I mentioned in a previous photo a day post, it’s just no longer my plot at the allotment and is now hopefully in someone else’s custody. I did leave the paint so I hope they maintain it in all its stripy gloriousness. The reasoning behind this is that even thought it is only a half plot, when you can’t dig and thanks to needing to work (and work need you to build up to full time again) you can only really spend half an hour on a Saturday and Sunday there as work is all you have energy for during the week, it’s not enough. It had taken weeks just to clear out the raspberries (and that’s only pruning the flowering shoots from last year) and for my husband to turn over just under half the plot. It wasn’t working and with growing season starting we took the decision that we should hand it back for someone else to take on the plot this year. Rather than dwelling in misery about no longer having the allotment, or how the 12x6m size of the garden which currently accommodates the lawn, our giant shed, the patio for a table and chairs and one raised bed (for flowers) really does not have space for veg, I’ve been planning. There’s a second patio space (actually it’s half a car parking space but the huge shed sits on the other half) and it can take a couple of smallish 1 x 0.5 m raised beds with liner bags (to protect the stones) sort of like the image below. We also have a selection of pots, a couple of deep bags for potato/carrot and I will just need to get inventive. 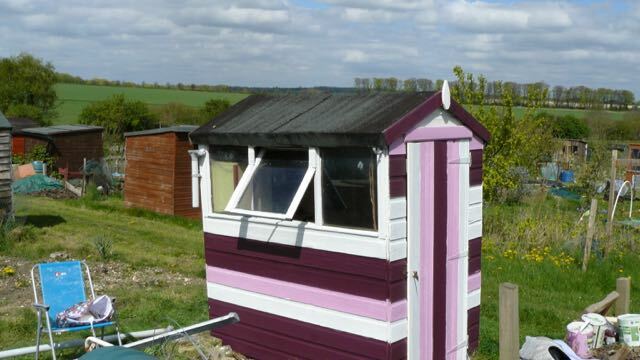 I also have my potting half of the shed … now of course I don’t have a photograph of it full of tomato and chilli plants from last summer but instead I have an image from during construction (DH designed and built it and he wouldn’t let me paint it funky colours so it’s a sensible brown shed). This was him removing the protective cover from our perspex type roof which covers half the shed before we put glass in all the windows (they were designed to take the panes from our old greenhouse) – hopefully having a 6 foot man in the image gives some idea of scale. It takes 4 full growbags so plenty of opportunity to cultivate seedlings and grow in there as well. My DH is fairly handy at DIY. 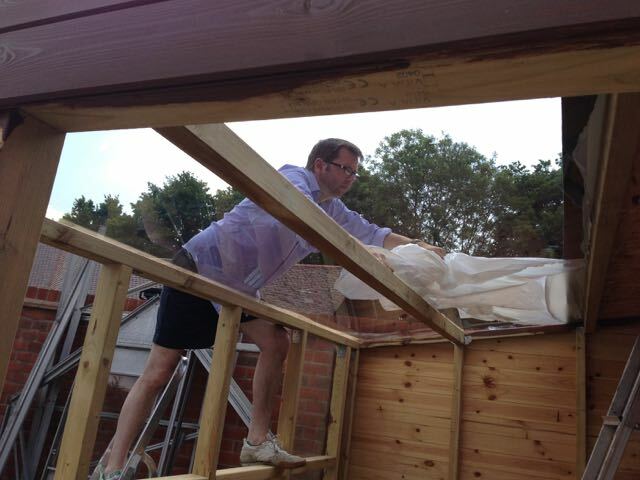 I used to do everything I needed around the house, including fitting a kitchen in the dim and distant past (and am still better at wallpapering than him) but he is good at all practical things and a whiz at woodwork (see shed above) and we always get the RollsRoyce of solutions. 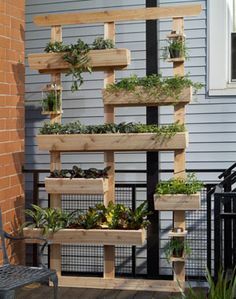 This got me thinking (as I was googling growing veg in small spaces) and we have a wall … it’s a very sunny and warm wall as it is completely south facing and I’ve been looking to try and cover it up a little to stop it radiating too much heat baking the grass nearby. 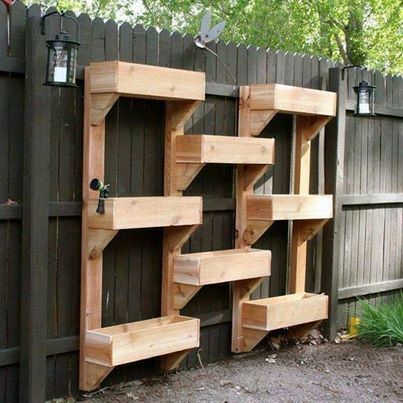 It is just screaming for a raised bed at the bottom to cover up part of the wall. 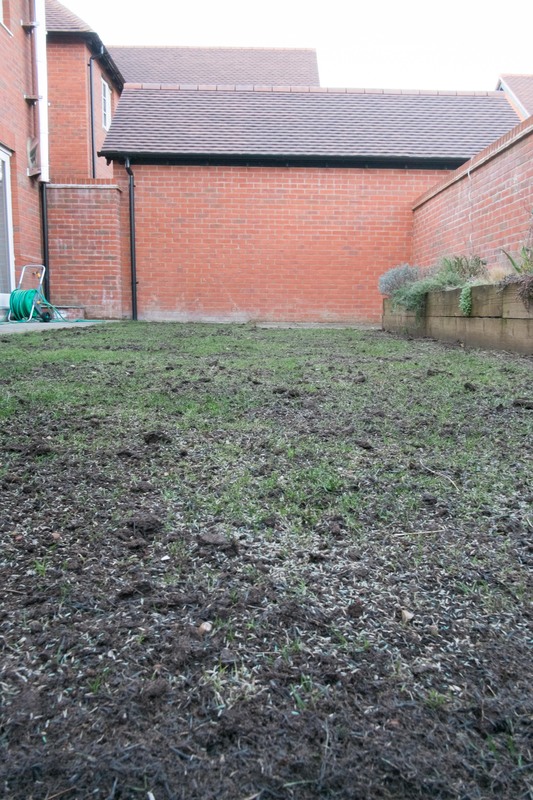 (The grass has just been treated – we added new lawn compost on the many many bare patches and seed yesterday and I’m currently hoping that it actually grows and that this year my DH does not cut the new grass 2 weeks after it’s sown and rips all the new shoots out). How cool is that. 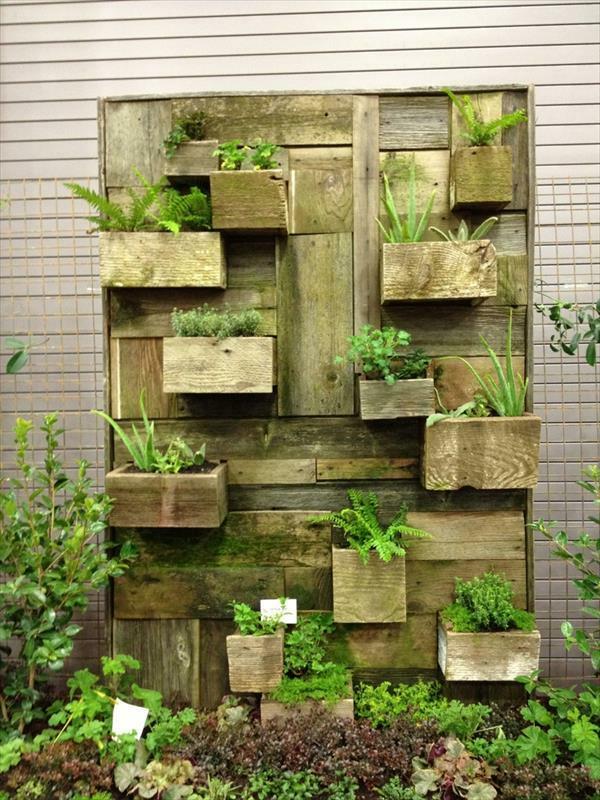 However … it’s not really what I wanted for this wall (but one day I will make a garden out of rain pipes). Anyway – that got me thinking considering pots as an alternative solution to one big(ish) bed. I’m now at the idea of having a larger and deeper raised bed at ground level and then a series of six containers meandering up the wall so have brought in the DH as chief builder. We’re still debating having uniform sizes or varied sizes, a regular or random pattern and if we should actually consider making more to drift up the wall above where the table and chairs will sit when we bring them out again. I’d quite like to paint the boxes nice colours (aka colourful plant pots) but apparently I’m not allowed (I may just attack one night with a paint brush when everyone is asleep). Over Easter while I’m safely away in Scotland thanks to a combination of seeing friends, family and work, my DH has made a start on three of the smaller containers – they’re not on the wall yet and we’ll wait till I’m back and the larger raised bed is installed before we put them on the wall …. watch this space for progress!